Ya Laziz invites you to celebrate Middle Eastern culture on the occasion of the international day of human rights! We will serve you a delicious 3-course meal, prepared by our Syrian chefs & while munching on our yummy food you will enjoy music performances, contemporary dance and talks by our amazing crew, reflecting on human rights and sharing Middle Eastern culture in their own unique way. 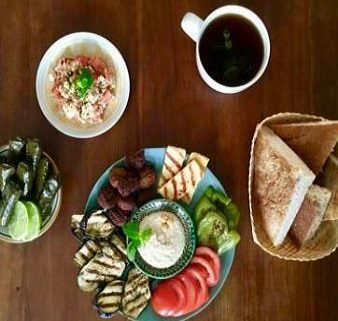 Ya Laziz is a cultural catering service powered by The Hague Peace Projects and a platform for refugees to share their culture, food and beauty from their countries of origin. Jol Alholo will show a contemporary dance performance! He is a graduate of the Higher Institute of Dramatic Arts in Damascus, Syria. Jol is a dancer, actor and choreographer, previously he did performance arts in the Middle East, now in Europe. He is specialized in Syrian folk dance and mystic dance. Emlyn Stam will perform Article 30 by Syrian composer Zaid Jabari! He finished his bachelor’s degree in June 2006 at the Royal Conservatory in The Hague. Since 2014, he has been artistic director of the New European Ensemble, an international ensemble for contemporary and 20th century music. As a soloist Emlyn Stam has made numerous appearances for the Dutch radio and television. He performed concertos with the Amsterdam Symphony Orchestra, Orquestra d’Espinho(Portugal) and the Schönberg Ensemble. How can I grow? How can I help others grow? That’s the question Adel AlBaghdadi, from Damascus-Syria, keeps trying to answer. He boldly calls himself a “Change Maker” because he makes the daily decision to be a part of the solution and not the problem. He believes in possibilities…he believes in a better future. When moving to the Netherlands, Adel started “WE organization”. A young innovative social initiative aiming to develop various projects to combat Xenophobia, build bonds and promote social inclusion. Adel aspires to make a meaningful, transformational and sustainable change and envisions a society based on core values that encourage us all to be constructive, productive and peaceful while embracing and cherishing diversity. Mary Wanjiku Gichuhi is an international speaker and entrepreneur. She is a mental illness survivor, domestic violence survivor and a single refugee mum. She is passionately transforming lives by helping audiences break through difficult times and discover their own self-worth and potentials. She is travelling and speaking at conferences, corporations, colleges and other events energizing people to defeat the challenges of the world around them.